Leaning back against the lounge, I relaxed, letting the chatter wash over me. Lazily my gaze swept the room as I listened, half to the conversation, half to the suggestion of commotion outside the door. How long, I wondered, until Butterfly started demanding my presence. Our study done, the talk had turned to admin, and then on to travel. Adventure looming for friend, my ears prick up as she tells us of the red-tape for visiting a Ugandan orphanage. No gifts, no special treatment. The best thing you can do is share skills with them, help them learn to improve their chances of getting jobs. I thought I might do some sewing, she says, and immediately, the cogs fall into place, and the wheels in my mind start turning. A lazy Saturday night in, and with a little help from a very kind friend, my plan came together easily. 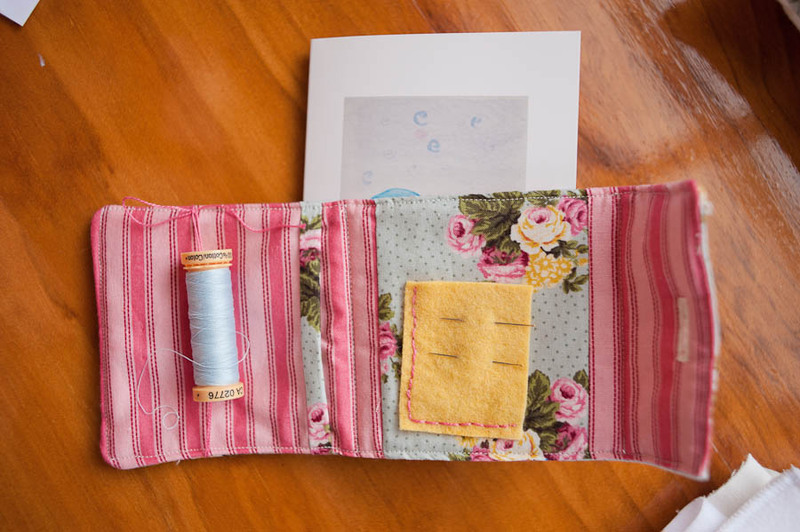 A little sewing caddy – wool felt to hold some needles, a place to tie in a reel of cotton, a little pocket to hold scissors or embroidery floss. 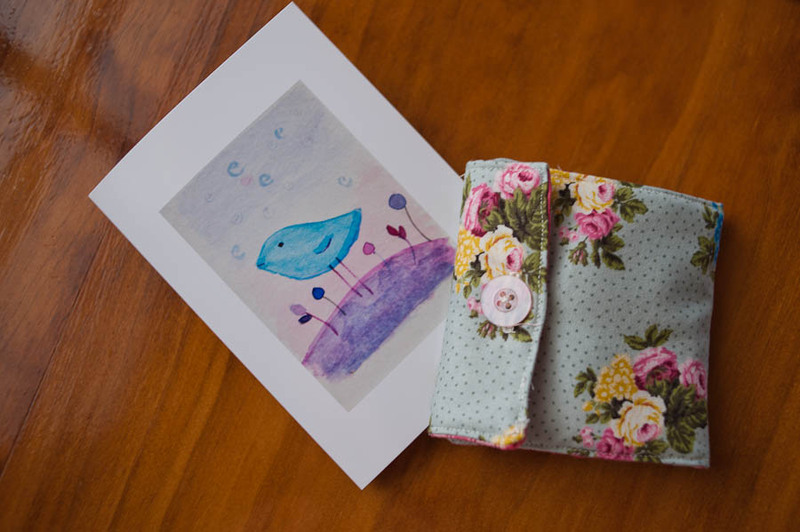 (the card is also mine, one of set of unsold note cards made with one of my early watercolours). Saturday, and everyone is present, accounted for and healthy. Running Bear is home after a few days away at a conference. Little Bear is ready for a rest as the end of first term approaches, so we are laying low. A productive trip to the nursery means an afternoon in the garden, if the rain holds off. Some painting to scratch an itch ignored for too long. Some filing and washing. A party for the same dear friend the sewing caddy is for. Prep for Sunday School. Books with my babies. Bubba Boy helping daddy outside while Butterfly naps and Little Bear keeps me company in the studio. A lovely easy Saturday, just the way we like it. Let’s do this! I like the idea of a little sewing caddy like that. It looks like a good size to carry in your pocket for emergency repairs, too! The card and the sewing caddy is just gorgeous and a great idea! Has you friend left for her trip yet? I wish her all the best for it.